Now that I have officially released the Luster Mica Powders to everyone, I want to start releasing Technique videos and Technique blog posts. I think seeing what you can do with these powders in action will really show you exactly how diverse they are. This first technique is about mixing the Luster Mica Powders with various gel mediums. Now, since the Luster Mica Powders already have a built in binder, we aren’t relying on the gel to work as a binder, but rather using the gel so we can get a different look and perform different techniques that we can’t achieve with using water and mica powders alone. Heavy Gloss Gels and Gloss Gels will add dimension to your work. 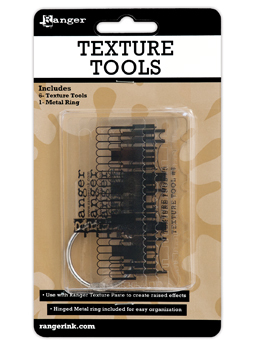 This extra body will allow you to use your mica powders with stencils and texture tools. You can also brush a thin layer of your mica infused gel over a project or portion of a project to seal it in or to layer on top of. 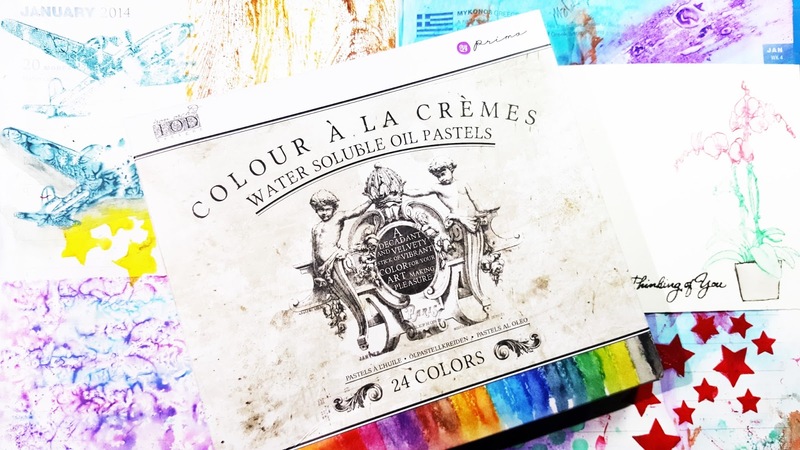 You can create multiple layers this way and protect the layer underneath from any additional colors that you would like to add with mica powder mixed with water, thus creating a resist effect. One drawback is that the shimmer doesn’t catch the light the same way it does as when the mica powders are activated with water. It gives it a completely different shimmer that is beautiful in its own way. We’ll be trying out 4 different mediums today with the Luster Mica Powders: Liquitex Professional Super Heavy Gloss Gel, Liquitex Professional Gloss Gel, Claudine Hellmuth Studios Multi Medium Gloss, and Prima Marketing Art Basics Light Paste (this is an opaque matte medium, but I threw it in to show you the difference). For all different gels I first mixed the powder in using a palette knife on a silicone mixing surface before applying to my surface. The Super Heavy Gel was a pleasure to work with. It mixed up easily and it works wonderfully with stencils. The stencil I used in this picture is called Stripes and it’s by Tim Holtz. They are made to be broken up like it’s shown here and I was easily able to apply the gel through the stencil with a palette knife. You can see how different some of the Luster Mica Powders look depending on the light angle and the color they are applied too. Hawaiian Orchid is a color shifting powder. It switches between violet to a more pink/ fuchsia color on black. 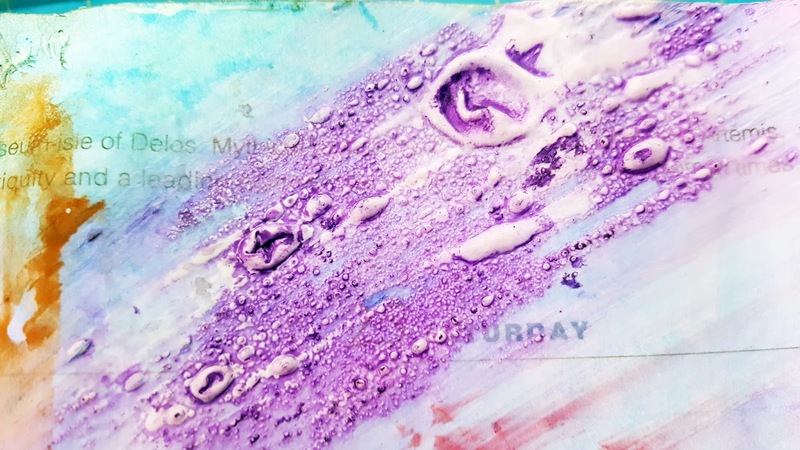 On white, it stays prevalently pink with a touch of purple shimmer coming through. On the upper right hand corner of the first and second picture you can see where we dragged one of the Texture Tools through the gel. It worked great! Gloss Gel preformed just as well as the Super Heavy Gloss Gel just with a little less heft to it. The gloss gel feels a little more creamy while the super heavy is almost more like a paste. They both dry completely clear and worked great. The smudge you see on the white background is from me partially cleaning the stencil and accidentally getting gel on the opposite side, so it’s by no fault of the gloss gel. 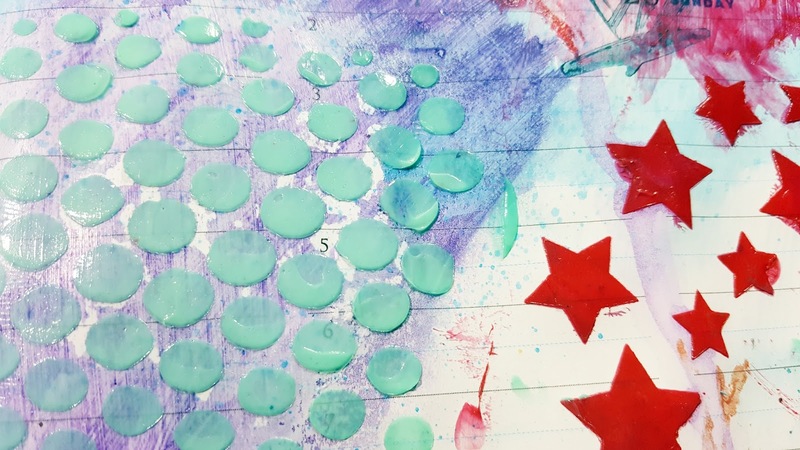 The picture shows the gel laid down via palette knife, one of our texture tools, and then used with the Tim Holtz Harlequin Stencil. As you can see from the pictures, Gramma Nutt color shifts as well. This color shifts from blue to a orange/gold. The shift is also more prevalent on the black cardstock whereas the white stays mostly blue with a little of the orange shimmer coming through. Claudine Hellmuth Multi Medium Gloss performed better than I expected. Being that this gel is less viscous than the other gels, I figured it wouldn’t perform well with the stencil at all. I could easily get it to drip from my palette knife. I was pleasantly surprised to see that it worked perfectly fine with the Tim Holtz Doily Stencil! 24 Karat Gold Luster Mica Powder looks pretty much the same on a light or dark, but still appears a little more brilliant on the black. Prima’s Light Paste is definitely not the first thing I would think about mixing with Luster Mica Powder. It is an opaque matte paste which is the opposite of what helps shimmer shine. However, I am glad I tried because I did discover something interesting which can have its time and place to be used. If you apply it thinly, you can see the color and a little bit of the shimmer. If it’s thick, then it is opaque and you really just get the color of the mica powder as it would have looked on a white background and no real apparent shimmer. BUT if you look closer to the bottom picture, you will see that it has some shimmer coming out through the matte paste. It reminds me of when the sun hits a rock just the perfect way in the desert. It has a beauty of its own and could be used for certain projects. Blue Ice is a color that is much more apparent on a black surface. When it is applied over white it really looks more like a super pale blue. That’s it for the first technique! I hope you learned something today! Thanks for stopping by! 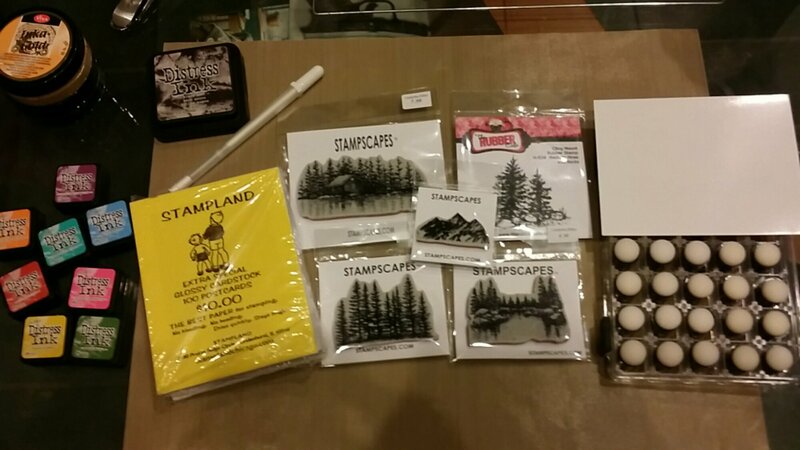 I went to the Rubber Stamp Events Convention yesterday with my mom. We now go every year together since she moved back to AZ. It was a nice time and I finally bought some things I was eyeballing last year. I did find a couple items on clearance, but of course, the main items I wanted were full price. Being that I still wanted them after all this time, I let myself purchase them. 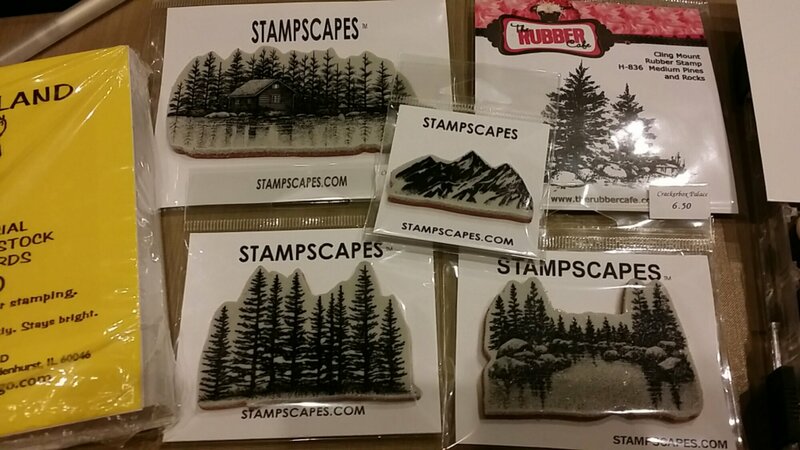 Stampscapes are these awesome silhouette style stamps that are used to form landscape scenes. They are unique in the way they are designed because you don’t end up with harsh edges and it is easy to put together a truly organic scene. A major bonus is there are over 100 informational videos from Stampscapes on You Tube. I’ve been binge watching them since last night! 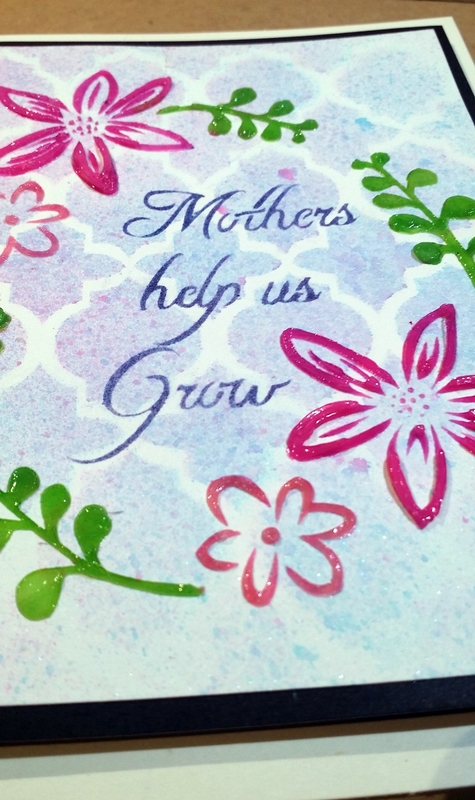 Dye based inks, glossy cardstock, Stampscapes stamps, sponge daubers (or some type of blending tool), white gel pen (for highlighting), protective work surface, inka gold is optional for rubbing around the edge of the finished piece. As you can see, one of those stamps is not by Stampscapes, but I figured it would work pretty well. I also found a life-like Victorian House stamp when I was digging around in my craft room that I figured should work. 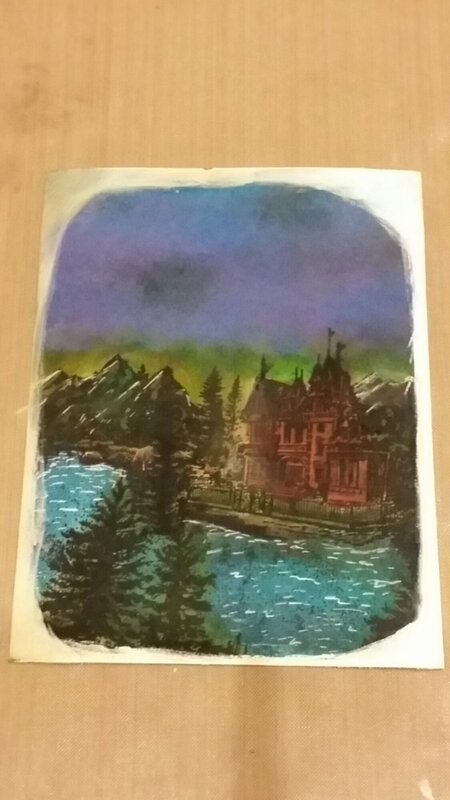 My first try at stamping the scene, I put the mountains in the completely wrong spot. You can see that on the left sheet. The second time I stamped, I got it right. You will need to do some simple masking along the way. I used just a paper towel. Which I then also accidentally smudged ink with that same paper towel in the sky and proceeded to try to make that accident look like it was on purpose. Not too happy that happened! My coloring and blending skills could definitely use some work. 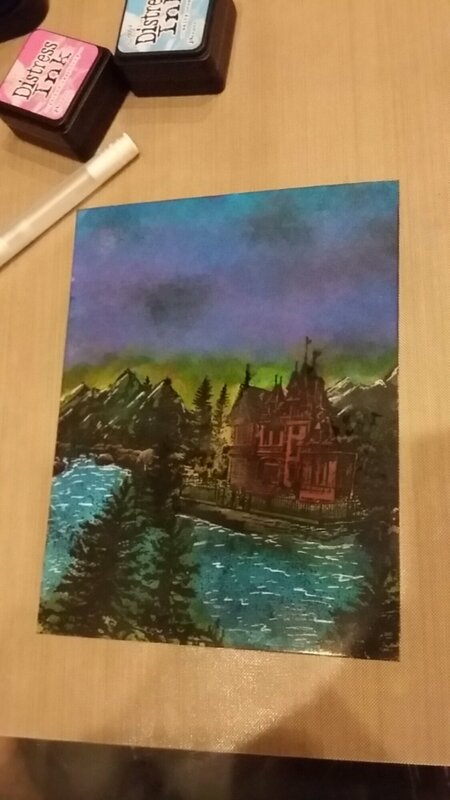 I used the gel pen to add highlights, waves, and tried to make a foggy light coming from the light source in the background. I might continue to blend this, but it was almost midnight and I had already been working on it for a while. You MUST have patience when blending or you will end up with ruined foam pieces or harsh lines. Light pressure and continued strokes is key. Here’s my end product. 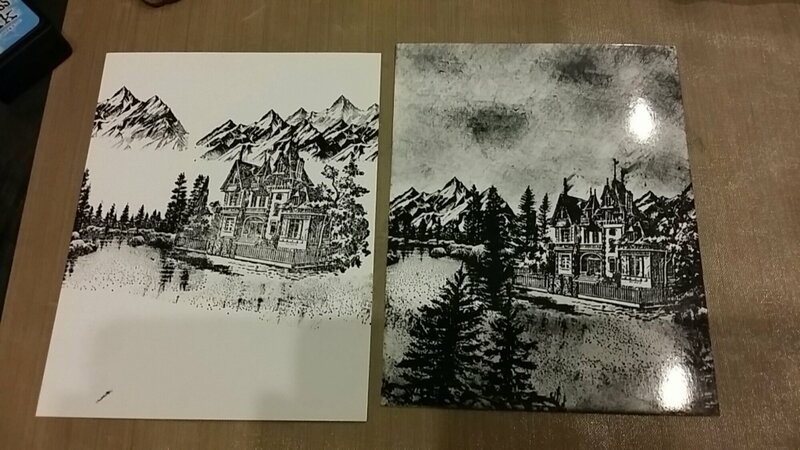 If I do this same scene again, I will make the Victorian a light grey and probably do the same for the mountains. I was playing downstairs and only brought a few inks down. My laziness of not wanting to go up to the craft room resulted in less than desired results. However, it was still a TON OF FUN and I will definitely be making more of these and turning them into Christmas cards :-)!! 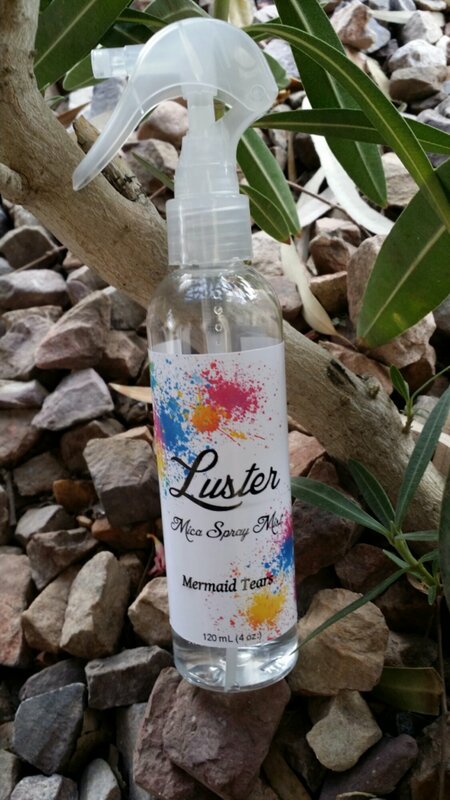 Luster Mica Spray Mists – Coming Soon! Hi everyone who stops by my little blog! I’ve been really busy lately working on developing my own Spray mists. Currently, I only have one color finished which is Mermaid Tears . It’s a beautiful blue with a hint of green and a lot of silver shimmer! I just got my potential bottles in today, so I slapped on a mock label so I could see what it might look like in the end. So, I thought I would share it with all of you. The 4 oz bottle with the upgraded sprayer is pictured. I will also be offering a 2 oz bottle with the more traditional spray top that we have all grown accustomed to when using spray mists. I still need to test these sprayers to make sure they are going to hold up to the demands . That is, they must be fine mist and anti-clog . I’ll be sure to keep everyone posted ! My Dad has always been fascinated with Military stuff. You name it and he probably likes it. Tanks, Planes, Ships, Submarines, Helicopters, Machine Guns, Anti-Tank Gunners, Missiles, etc. He has never served but he has always shown an interest in all things Military. I remember him taking my sister and I to these military museums when we were little. I got to see helicopters, crawl around in tanks and move the turret, and I even saw (and heard and FELT) them fire up one of those old silver colored war planes out at Falcon Field in Arizona. I capitalize “felt” because the strong winds of the propellers chucked sand and rocks and it hurt! Every time Father’s Day has come around in the past I have rummaged through the card aisle in the grocery store hoping and wishing I could find a cool Father’s Day card that didn’t have something to do with Fishing, Hunting, Ducks, or Sailboats. I would always end up picking the sailboat cards since that was something he likes as well. I was never excited to give him his card and it never really bothered me that much since I felt I did the best I could. I’m so happy that I got into card making, so this year I get to give him a card that he will think is cool! 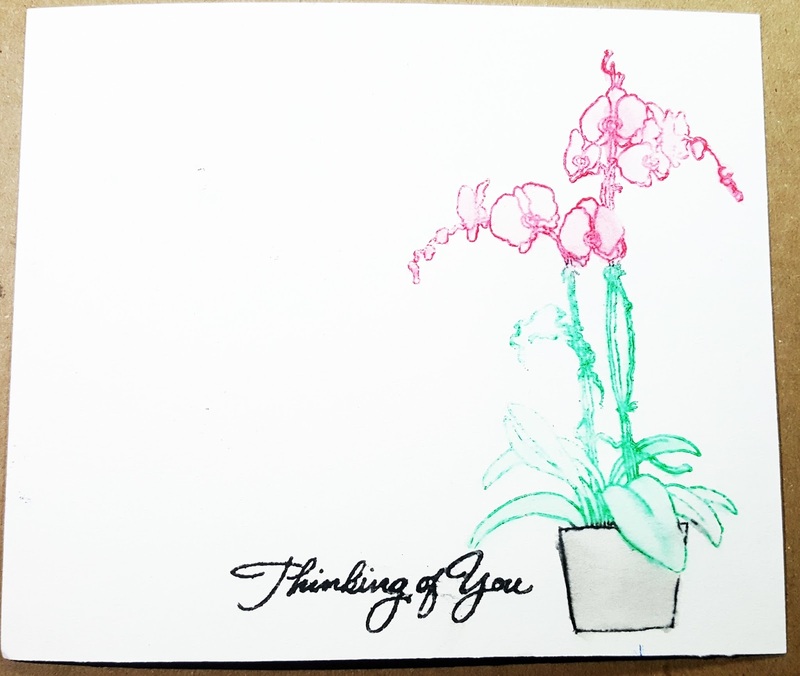 My dad is one-of-a-kind and that is the type of card he deserves! Now, before you look at this card, remember I am new to all of this crafty wonderfullness. I also decided to play around with some mediums I have never tried before. I think if I had more military themed items I could have done this card a little better, but I think it’s pretty cool considering what I had to work with! I will be posting a video about this card either later today or tomorrow. I talk about how I made the stream and the rest of the card. F.Y.I. 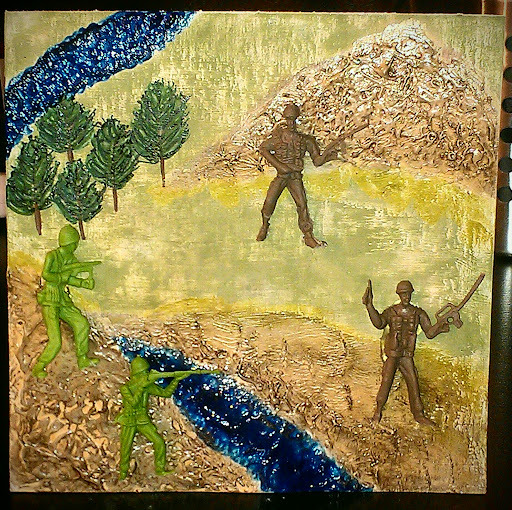 – The army men you see here were from the Dollar Tree and they came in a big pack. I just carefully nipped off the platforms under their feet using my Tonic Studios scissors (LOVE those scissors by the way!). I hope you like this card and it gives you an idea of what type of card you might want to make for your Dad. I know if I had used a paper pad or done something more traditional it may have looked a little better, but my only focus on this card is to have my Dad open it, smile, and say “Cool!”. I recently purchased the McGill Paper Blossoms tool set at the Scrapbook Convention I went to. Last night I tried out the tools with some paper flowers I die cut using my Donna Salazar Rose Creations Die by Spellbinders . Click the highlited link to find the die template set at my store. I also have the Donna Salazar video in the item description. 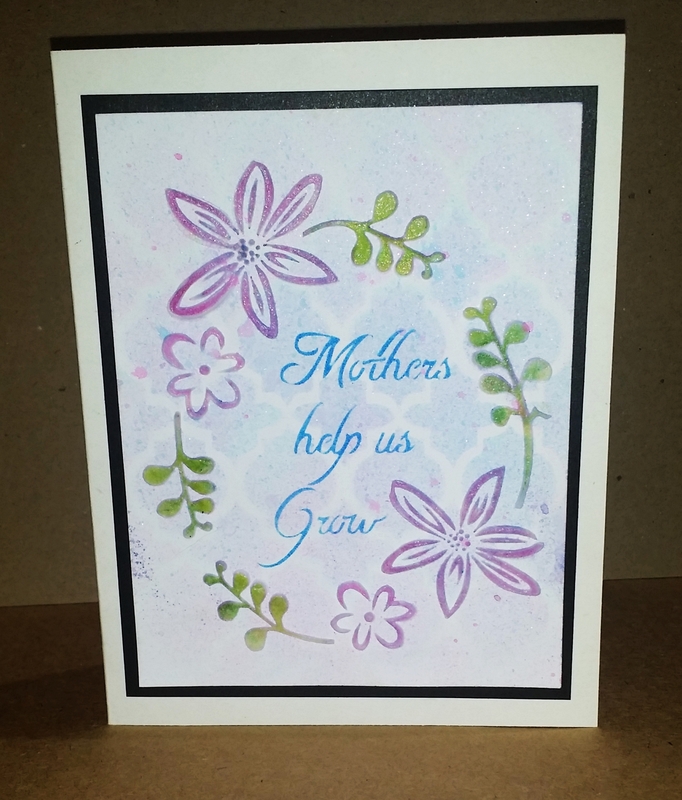 After I made these flowers I went on YouTube and found a video by Donna Salazar herself showing a couple of ways you can use her die. I’m telling you, this is a die you are going to want! It even comes with 3 different sized leaves. I have a tutorial below, but read the whole thing first! I tell you a couple of things that I would improve and do different the next time I make one of these. •Big Shot or other die cutting machine that works with Spellbinders wafer-thin dies. Ok! That looks like a ton of supplies, but hopefully you already have a lot of that stuff. Wait…where did those come from?! LOL. 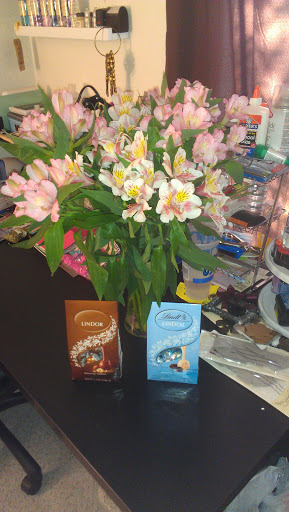 I walked in my craft room the other day and found these beautiful flowers and two bags of my favorite chocolate truffles. He gave them to me for no reason! I couldn’t believe it and I was so blown away. It made me feel so special. I had to share! Ok back to the project haha! Here are some of the supplies I started with. I ended up only die cutting less than half of this paper out. Running that die through the machine time and time again gets a little boring. Besides, I started to get a neck ache! You actually just need to run the full set through once to be able to make a flower. 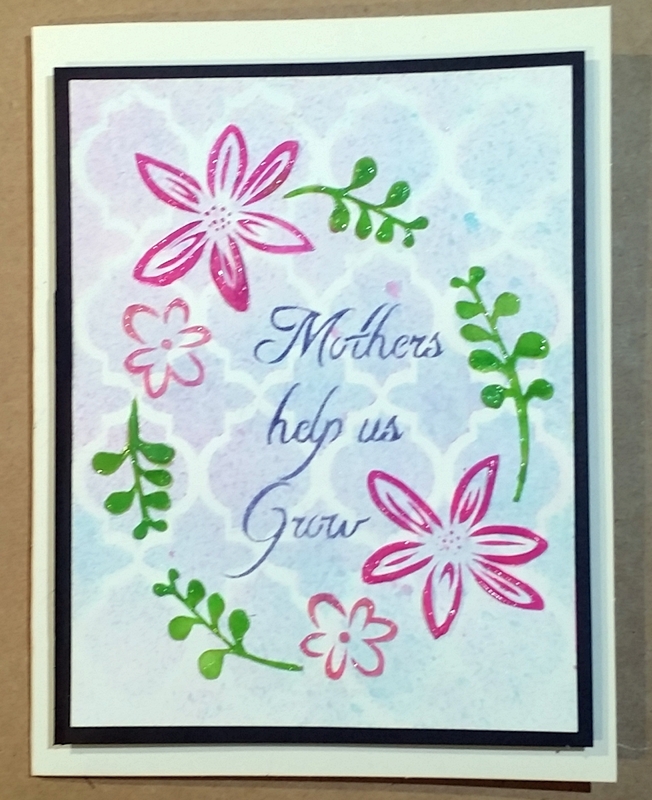 I just kept running it through with different colors since I plan to make a ton of these to put on Mother’s Day Cards. I cut down the papers and ran them through the Big Shot. Here are the piles I ended up with when I was done with all the cutting. I haven’t tried the vellum yet, but I definitely plan to! After I die cut all of these out I inked up the edges with a distress ink that closely matched the color using half of a cosmetic sponge. I did that to the leaves too. The next step was forming. This is the part that would probably be easier to follow on a video. There actually is a video by McGill on YouTube showing how to make the paper flowers using their punches. I used a few of the techniques I learned from the video, but I had to modify them to use my dies instead. Basically what I am showing here is that I took the tip and swirled it around in a circle around the hole in the middle. I also swirled it around in circles on each petal. This apparently breaks up the fibers, but it also makes it start to shape and lift. I repeated this with each size flower and slowly moved down the size of the ball point from 8mm to 6mm to 5mm to 3mm as I was getting to the smaller flowers. The picture below shows what it looks like at this point. If you like this look , you can actually just stop here and put a brad through it. If I was to stop here and use the flower just like this I would, however, add another one of the largest flower layers and curl up a small one for the middle. I would also still add the leaves to it. If you want it to be even more dimensional, you can add glue to the bases of each part and glue them together. That will force them to be tighter and more 3D. Donna Salazar shows that in her video about this die set. The next step involves taking the tweezers out of the tool set and putting it through the hole to clamp on to the middle of each petal. You then take your thumb and forefinger and form the petal around the tweezers. Do this to each and every petal if you want to get this different look I will show in the end. You also take the tweezers and bend each side of the petal down. This part is really easy and doesn’t take that long. This picture shows what the flower looked like after I completed the bending. The leaves were done the same way I did the petals. I first swirled around on them with the 8mm ball point then I bent the ends. One the leaves I also took a very small pointed tool and made a line down the middle. I am not sure if you can really see that though. Next, I just put a little Glossy Accents on the bottoms of each flower piece and stacked them up. Pretty Simple. You could use hot glue for this part instead if you want. Here is what it looked like after gluing was done. I decided that I didn’t like how wide the opening was so I used another one of the smallest flowers. 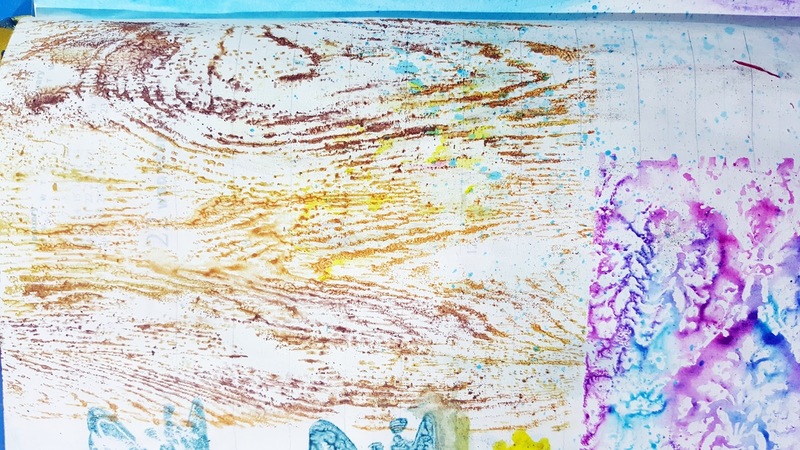 The paper I used was not double-sided so I had to use a mixture of my pigment inks and distress inks to try imitating the patterned paper. When I make these again I will either make sure I can imitate the paper well or just use double-sided paper. I overlapped and glued the petals together to get a tight bud for the middle. I did not glue the last petal to the first just because I wanted it to look like that. It is up to you how you decide to glue it together though. I glued the small bud to the middle of the flower using Glossy Accents again. I wanted my middle metal brad to kind of match the flower so I took a silver brad and dyed it with Adirondack Alcohol Inks. It didn’t take too long to dry. Be careful though because I didn’t realize that I should have dabbed out the ink stuck under the bottom of the top part of the brad. There was some in there and it got on my flower as I was lowering it in. Oops! All the pictures just above are of the finished flower . Hopefully you were able to follow my odd instructions. If you need or want a video, just let me know! I wasn’t comfortable with doing a video the first time since I didn’t know at all what I was doing, but now I think I could do it. Next time I make these flowers I will use more layers like 2-3 of some of the same sizes for more fullness. I will also probably use double-sided paper.